Wishing You A Modern Christmas! It’s Christmas time at the Patio! What better way to celebrate Christmas present than to bring out Christmas past. Need new ideas for your holiday party? Then visit the Patio Party Planners Page. The space-age technology of the Lounge-o-Lizer can find that retro cocktail recipe you’ve been looking for and classic holiday buffet recipes abound on Patio Culture’s own Buff-o-Matic. TV schedules for all of you favorite holiday classics are here too, from Rudolf to Charlie Brown! Need classic holiday music? Let Bing, Dino, Frank, and the gang spice up your home or office with the Holiday Music Player. Track Santa this Christmas Eve with NORAD by following our links to the 2009 NORAD Tracks Santa official site. The Ruskies won’t dare interfere with the Big Man! Don’t forget to view our virtual Christmas card before you leave. It’s our way of wishing Happy Holidays to you all! Entry filed under: Patio Culture, The Patio. 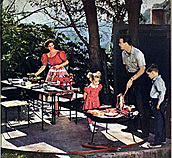 Tags: buffet, christmas, cocktails, Food, holidays, life, NORAD, Patio Culture, retro, Santa Claus, TV, vintage. “Nightmare” for Halloween! 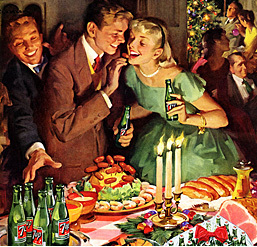 New Year’s Eve: Party Like It’s 1959!